Use Italian flair to brighten up a drab day. 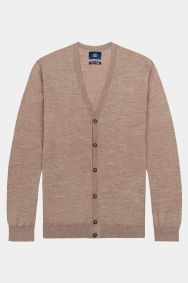 Crafted in Italy from pure merino wool, this oatmeal cardigan from Moss 1851 can be used to bring colour and warmth to any number of outfits. Straightforward styling makes it suitable for a day in the office or an evening out, while the use of warm, soft and breathable wool guarantees total comfort. A quick hand wash is the best way to keep this cardigan looking its best. Pair with a white t-shirt for an easy-going, off-duty look. Make use of a dark jacket to smarten things up instantly. Excellent item - very pleased with it. Don't wash it as the last one shrunk!! Not received. Was looking forward to having new clothes for work!